Generally fits tiny breeds: Yorkie, Miniture Poodle. Approximate 8 lbs weight or under. Generally fits Miniature Poodle, Westie, Fox Terrier. Approximate weight - 9 to 25 lbs. Generally fits Rottweiler, Bull Terrier. Generally fits X-large dog - Wolfhound. For a correct fit, measure around widest part of snout. 1. 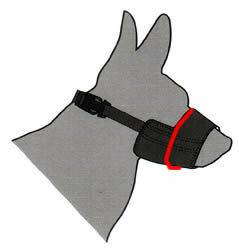 Open buckle and place muzzle over dog's snout. 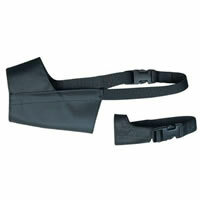 Make sure muzzle fits comfortably and is not too tight or too loose. 2. Bring straps behind dog's head below the ears and buckle. 3. Adjust straps until muzzle fits the dog snugly. Do not overtighten. 4. Check fit to make sure dog is comfortable.